In The USA, there is a striking negative correlation between the relative price of housing and GDP growth over the following 5 years Given this simple correlation, it is possible to forecast the great recession using just that variable and a trend. In fact, the forecast recession is even more severe than the actual recession. 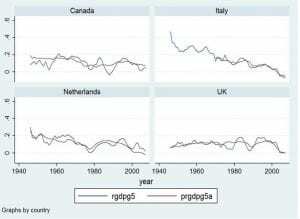 This note examines other developed countries using the data set assembled by Oscar Jordà, Moritz Schularick and Alan Taylor which includes annual series for the nominal price of housing for 17 developed countries. For 13 of these countries, there is a strong negative association between the relative price of housing and real GDP growth ove the following 5 years. An excellent fit of the time series of GDP growth can be obtained using only three variables. Out of sample forecasts are fairly useful – better than many medium term out of sample forecasts, but with markedly larger residuals than the within sample fit. Hpreal is the ratio of the housing price index to the consumer price index, rgdpg5 is the growth of log real GDP per capita over the following 5 years. The disturbances are clearly not independent over time as the dependent variable is a moving average of growth over 5 years. 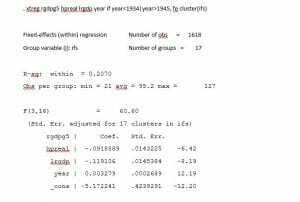 Standard errors are calculated allowing correlation of disturbances for the same country using the cluster() option. This regression suggests a pattern worth exploring. The t-like statistic definitely does not have a t-distrubution under the null, because the two series are not stationary. 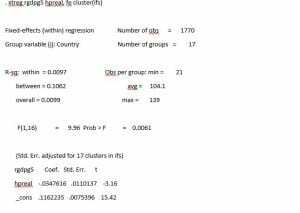 Also 17 is not a large number of clusters. Now as a next step, I exclude the World War II years and add two extremely important growth related variables, lrgdp which is the log of real gdp per capita and an exponential trend which captures at least some of the change in technology. As is very well known, there is strong evidence of convergence towards this trend for these developed countries. The coefficient on the relative price of housing increases markedly in magnitude. Most of the rest of this note focuses on post World War II data. A hint of an explanation of the pattern is obtained by regressing the growth in the natural log of the relative price of housing over the 5 year interval lhprealg5. There is fairly strong evidence of regression of relative price of housing towards the trend. This suggests that high house prices imply a decline in house prices which can cause a decline in aggregate demand through reduced residential investment, reduced home equity and (in recent decades) reduced access to home equity loans. 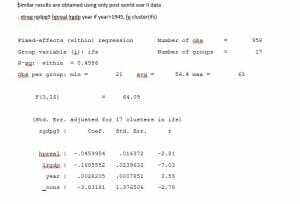 In fact, the coefficient of 5 year GDP growth is reduced by half and becomes statistically insignificantly different from zero if lhprealg5 is included in the regression. This isn’t the whole story however, if pre world war II data are also included, the coefficient on hpreal remains strongly significant. 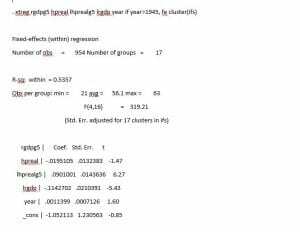 The panel regressions impose identical coefficients including a common exponential trend. Perhaps as a result, they give extremely poor out of sample forecasts. It is also necessary to allow coefficients to vary from country to country to see whether the pattern is robust or driven by a few extreme cases. This may simply reflect the fact that per capital real GDP growth rates have declined and the relative price of housing has increased. 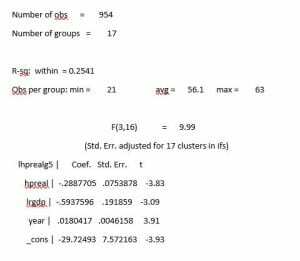 Separate regressions analogous to the panel regressions reported above are reported below. Standard errors are calculated assuming moving average disturbances, since the dependent variable is a moving average. 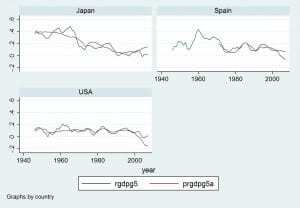 Figure 1 shows the fitted values for 5 year per capital real GDP growth (prgdpg5) and the actual series (rgdpg5). For the countries with small (or positive) coefficients on hpreal, Australia, France,Germany, and Switzerland, the fitted values are close to declining trends corresponding to generally slowing growth. For Denmark, Spain, Finland, Great Britain, Italy, Japan, the Netherlands, Norway, The UK and The USA, the fitted series strikingly matches fluctutations. Belgium, Canada and Sweden are intermediate cases. In general the fit is striking. It is not easy to forecast GD P growth over five year intervals and quite unusual to match it so well using only three explanatory variables one of which is a trend. As in the case of the panel regressions, out of sample forecasting performance is not as impressive. To forecast out of sample, I estimated the parameters using data on housing prices up to 2000 ( so the last interval of log per capita real GDP growth is 2000-2005) then forecast through 2013, the last available year. I used lrgdpmusa — the log of the ratio of real per capital GDP to US real per capita GDP – instead of lrgdp (This gives better out of sample forecasts – so the results reported below involve a bit of data snooping). The correlation of out of sample forecasts and outcomes is only 0.2702 For Portugal and Japan, the out of sample forecasts actually have a negative correlation with outcomes. For Portugal only 12 20th century observations are available to estimate the parameters, so the failure is not surprising. 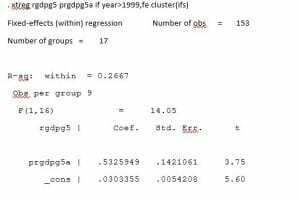 If Portugal is excluded the correlation of 2st century forecasts and outcomes for the remaining 16 countries increases to 0.3496. This performance is, modest but at least better than the performance using only lrgdpmusa and the year. That gives out of sample forecasts (for Portugal included) which have correlation -0.036 with outcomes. Allowing for a country specific correction factor gives a very different impression – the fixed effects panel estimate of outcome on forecast gives a regression coefficient of 0.532 and a t-statistic of 3.75 (to be interpreted with caution as always since the series are not stationary). 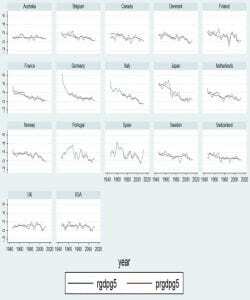 The graphs of rgdpg5 and the forecasts including out of sample forecasts prgdpg5a agains show extremely impressive fit within sample for Denmark, Finland, Italy, Japan, the Netherlands, Norway, Spain, the UK, and the USA. For the Canada, Italy, the Netherlands, and the UK, out of sample forecasts are impressively close to outcomes. 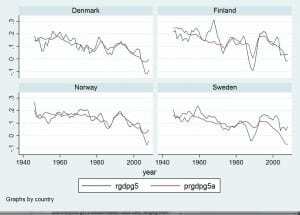 This is also true of Finland, while, for the other Nordic countries, forecasts are well below outcomes – the regression implies that the great recession was surprisingly mild for Denmark, Norway and Sweden. Similarly an even greater great recession is forecast for the USA. For Japan and Spain no recession was forecast. For Japan, Spain, and the USA out of sample forecasts are markedly further from outcomes than are fitted values within sample. 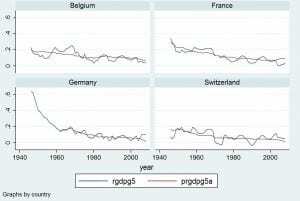 As noted above, even within sample, housing prices do not have a strong correlation with subsequent real per capita GDP growth in Belgium, France, Germany, and Switzerland. Similarly, out of sample forecasts are simple extrapolations of the trend of declining growth rates. Finally the out of sample forecasts for Portugal and Australia are abysmally bad. For Portugal, this was noted above and is easily understood given the tiny sample used in estimation. Overall, the out of sample forecasts perform moderately well. There is a striking negative relationship between the relative price of housing and per capital real GDP growth in the following 5 years. This appears in fixed effects panel regressions for 17 developed countries. The pattern is present both before and after World War II. It is partially explained by the mean reversion of house prices – high relative prices are correlated with low growth of the relative price and house price appreciation is correlated with contemporaneous GDP growth – presumably because of an effect on aggregate demand. When each country is studied separately, the relationship is dramatically negative for 10 of 17 countries. 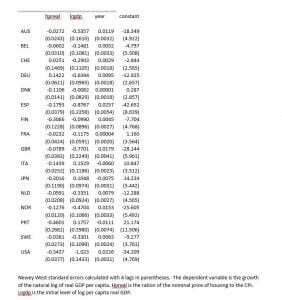 For all 17 countries, the time series of medium term GDP growth is fit extremely well using a very simple regression including the relative price of housing. A similar simple regression gives moderately useful out of sample forecasts in which estimates based on data preceding the great worldwide recession tend if anything to imply forecasts that the early 21st century housing boom would be followed by a recession even more severe than the actual great recession.